The Supreme Court Chamber of the Khmer Rouge tribunal will conduct three days of hearings later this month in the case of torture chief Kaing Kek Iev, who was found guilty last year of atrocity crimes. His 2009 trial lasted 77 days under the Trial Chamber of the UN-backed court, and many victims of the regime were outraged by the 19 years he received in commuted sentence. The Supreme Court hearing will mark the completion of the trial, the court’s first. It is scheduled to begin March 28 and will be much shorter than the original trial because the appeals are limited in scope, a tribunal spokesman said. 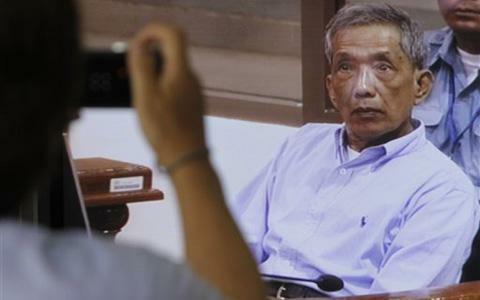 The Supreme Court hearings will mark the official end of the tribunal’s first trial, during which Kaing Kek Iev, better known as Duch, admitted responsibility for the more than 12,000 deaths that took place at Tuol Sleng prison under his leadership. He expressed remorse and sought forgiveness from the families of his victims, and in the end, he asked to be released. His sentence was commuted form 35 years to 19 years. Tribunal prosecutors are now seeking a full 45 years imprisonment. The lower court also issued little in the way of reparations for civil parties, choosing to list the names of some on the tribunal website. The question of whether Duch is one of those most responsible for the crimes of the Khmer Rouge—a key mandate for the court—was raised by his defense lawyers following his trial. The question of sentencing was raised by prosecutors. And the question of reparations was raised by civil parties. According to the tribunal schedule, the first day will be dedicated to Duch’s personal jurisdiction and whether he committed crimes against humanity; the second day will focus on his sentencing; and the third will focus civil party appeals.